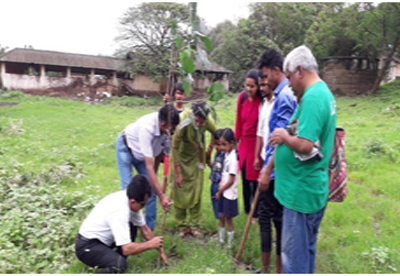 •On July 17, 2018, Teachers and 67 SY, TY and MSc-II Students of the Department participated in a Tree Plantation Drive organised at Aarey Colony (Unit 16). The Drive aimed to counter the reduction of the green cover and restore the eco-balance of the area. Mr. Mohan Bisht, the ‘Conservation Guide of Aarey’, providedinformation about the process of plantationMr. 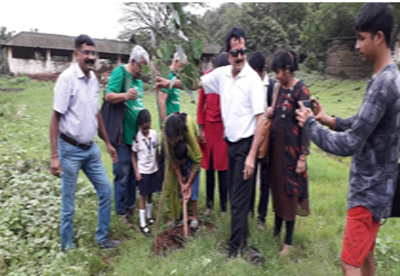 Subhash Rane and Mr. Rajesh Vedant of Save Aarey Foundation for Enviroment, NGO, were also present. 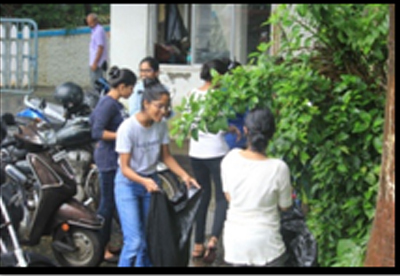 The group planted nearly 50-60 saplings of Gulmohar, Peepul and Sesam. 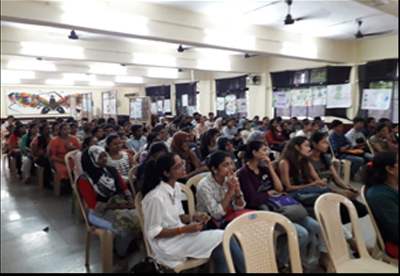 •On July 21, 2018, 85 TY and MSc-II Students of the Departments of Microbiology and Biotechnology attended a lecture on ‘Clinical Research Methodology’, which was jointly organised by the two Departments. The speaker was Mr. Mukesh Saroj of ‘CLINOMIC — Centre for Clinical Research’. He spoke about the meaning and basics of Clinical Research and its various components in the prevention, diagnosis and treatment of various illnesses. He also discussed the various career opportunities available in the field. 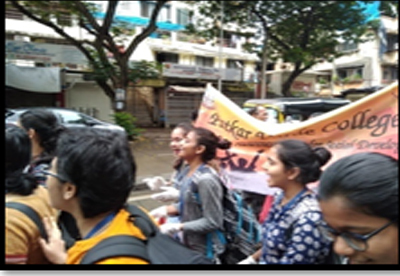 Other members of the Centre — Ms. Chaitali Pande, Ms. Heena Pitale, Mr. Deepesh Nair and Mr. Jitesh Naik — were also present. 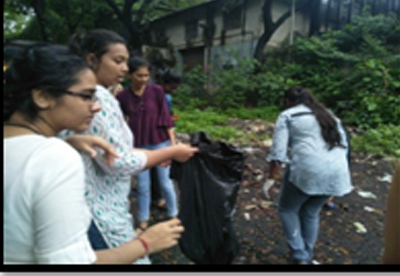 •On July 21, 2018, 31 SY Students of the Department participated in a Clean-up Drive organised at Aarey Colony, in association with Dairy staff, MCGM P/S ward, Save Aarey Foundation for Environment (SAFE) NGO,and 250 NCC students. The Drive aimed to encourage residents and walkers to keep the area litter- and garbage-free. After the Drive, the group visited the Central Aarey Dairy and were shown the various processes involved in the packaging and distribution of milk and milk products. 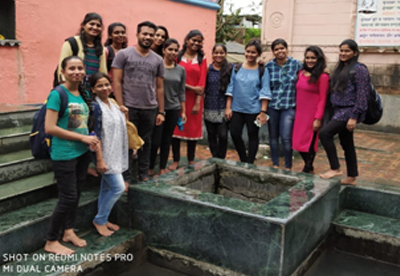 • On July 28, 2018, 16 Students of MSc-II were taken to visit the hot water springs at Wajreshwari, Virar. Samples of the water were collected for the study and isolation of thermophile and thermophilic enzymes. •On August 7, 2018, 39 TY and MSc-II Students attended a guest lecture on ‘Research Methodology’. The speaker was Dr. Sheela Kamath, Former Head, Department of Microbiology, Mithibai College. Dr. Kamath has numerous research publications to her credit, and as such was the ideal speaker on this subject. She spoke on the importance of research work and also about such practical aspects as how to start a project, finalising the methodology, using and citing references, refining ideas, documenting results, and writing the thesis. Dividing the Students into groups, Dr. Kamath assigned them all research topics and asked them to formulate the research problem and prepare an outline for the project. 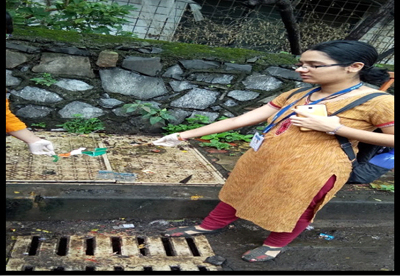 This practical application of the concepts discussed helped Students immensely. 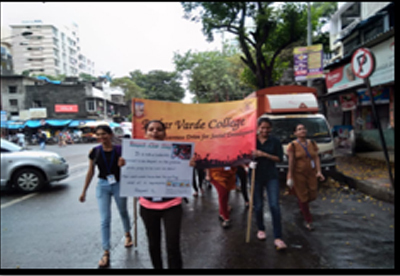 •On August 16, 2018, 26 SY Students participated in a post-Independence Day Clean-up and Awareness Drive, “Respect our Flag”, at Goregaon Railway Station (West) and its vicinity. While people flaunt the tricolour proudly on August 15, these paper flags litter the streets next day. This Drive aimed to create awareness that this constitutes disrespect towards the National Flag, and is a punishable offence as per the Flag Code of India. 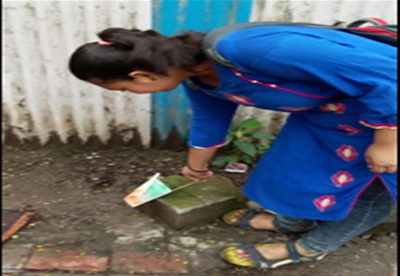 Students displayed the proper ways of disposing of soiled or torn flags, that is, through burning or burying in the prescribed way, and in a manner consistent with preserving the dignity of the national flag. 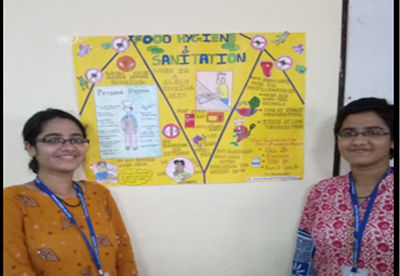 •On July 20, 2018, nearly 30 SY Students of the Department participated in a poster exhibition that aimed to create awareness about ‘Food Hygiene and Sanitation’. The exhibition was arranged at various venues in the College. 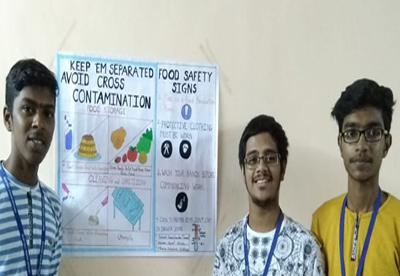 Working in groups, the Students explained the various ways in which foods could get contaminated, and the practices involved in protecting food from risk of contamination. 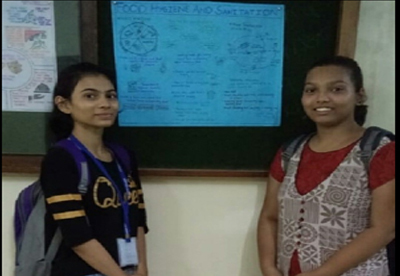 The activity not only helped Students from other streams to learn about how to prevent food contamination and thus illnesses, but also encouraged Students of the Department to think creatively to express their ideas. 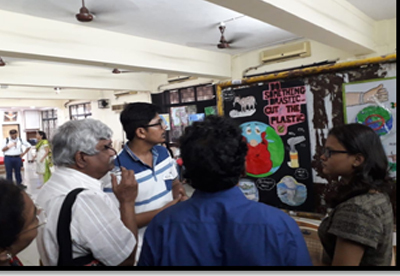 •On August 11, 2018, the Departments of Microbiology and Biotechnology jointly organised an inter-collegiate Poster Presentation Competition on the topic ‘Let’s Go Green’. 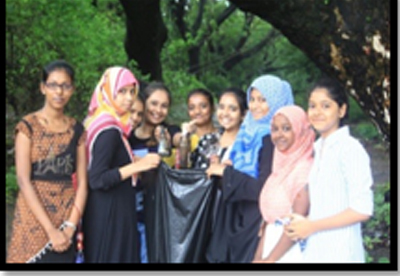 The theme of the Competition included such topics as ‘plastic — threat to our environment’, ‘alternative use of plastic’, ‘reduce, reuse, recycle’, and ‘consequences of plastic overuse’. 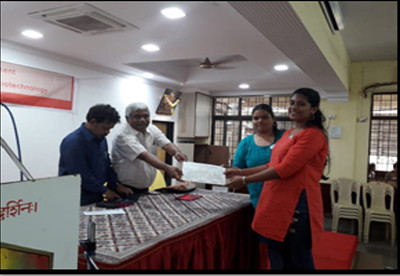 Nearly 102 participants from within various Departments in the College and from other colleges in the City participated, and the Competition was judged by Mr.Subhash Rane (Trustee, Save Aarey Foundation for Environment) and Mr.Sunil Lad (Senior Facilitator Officer, Malad, BMC). 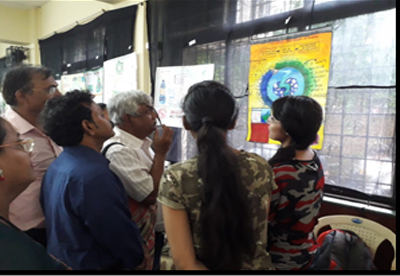 Mr. Vitthal Parthe (Ex PTM Member, BMC) and Mrs. Vasuda Kavade (Andheri, BMC) were special invitees for the Competition. The Competition was a huge success and the feedback from the participants was excellent.